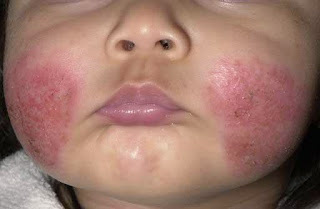 A 1 year old boy was brought to a general physician by his mother with the complains of irritability, trouble sleeping and a dry, scaly and itchy rash on his face. Mother says that the child has been scratching his face and is getting irritable most probably because the rash is itchy which is also disturbing his sleep. The problem has began since the changing season last month. Two of his older siblings also have had similar skin problems and are also diagnosed with asthma. The above case was diagnosed as Atopic Dermatitits/Eczema. Eczema is a term used for various inflammatory and rash like skin conditions or it may be used alternatively for a condition known as Atopic Dermatitis. Atopic Dermatitis is a chronic skin condition that usually starts in infancy and early childhood and some may continue to have it even in adulthood. The term atopic is used to describe a condition in which a patient becomes overly sensitive to allergens in the environment. Dermatitis means a skin that is inflamed, red or swollen. .
Clinical Features: The clinical signs and symptoms of eczema may vary widely. Dry, scaly and itchy skin. There may be oozing and weeping fluid. The itching may come and go. The child may be irritable and may have trouble sleeping. The skin may get infected secondarily due to continuous scratching and rubbing against bedding etc. A rash that usually begins in the creases of elbow and knees. Other places for the rash to appear are neck, wrist, ankle and the creases between the buttocks and the legs. With time the skin may get bumpy with color changes. Itching present almost all the time. Rash that covers most of the body. Skin that is irritated very easily. Management: Diagnosis is usually done with history and clinical presentation. Sometimes a patch test can be done on the skin to detect allergies. There is no treatment that can cure atopic dermatitis but it can be controlled and be prevented from getting worse. 1. Certain drugs can be given to control itching. 2. It is very important to prevent infection and to treat any secondary skin infection. 3. Moisturizing and keeping the skin hydrated is helpful. 4. Topical steroid help reduce the skin inflammation.